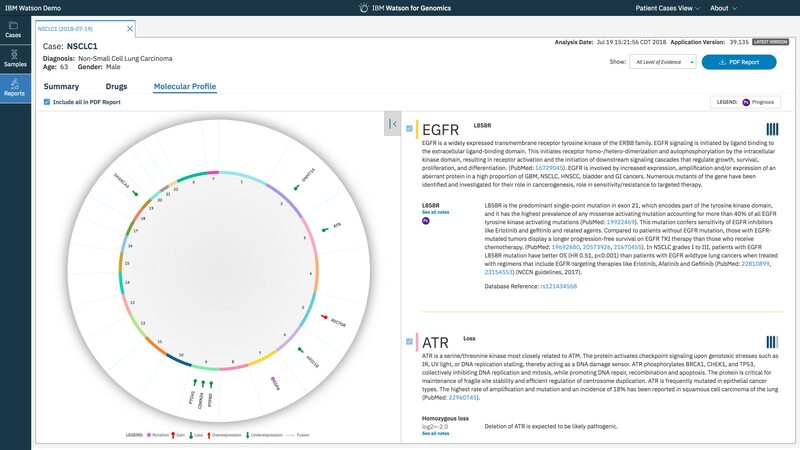 Watson for Genomics automates the annotation and prioritization of cancer genomic aberrations, highlighting their therapeutic, prognostic and diagnostic significance. It identifies a comprehensive list of potential targeted therapy and immunotherapy options and biomarker-based clinical trials options. The molecular profile feature provides in-depth clinical interpretation of the genetic alterations in the sample, enabling clinical decision making for personalized cancer care. Watson for Genomics allows its user to save time and reduce variability across reports with rapid, consistent, and efficient interpretation across cancers. Identified therapeutic options associated with each alteration are supported by a drug overview, the mechanism of action and rationale for the association in a clearly defined level of evidence model. Information about drug responsiveness and drug resistance is provided with the sources of evidence presented via hyperlinks to enable easy navigation. Evidence sources include but are not limited to: FDA drug labels, NCCN guidelines and clinical and preclinical evidence from published literature. Watson for Genomics is designed to comply with HIPAA and GDPR requirements. Watson for Genomics leverages AI to extract structured and unstructured data from peer-reviewed literature to continually grow its knowledge base. It provides variant information and clinical content that is up-to-date — based on the latest approved therapeutic options including targeted and immunotherapy options, professional guidelines, biomarker-based clinical trial options, genomic databases and relevant publications. All content is validated by subject matter experts. Watson for Genomics allows scalability for large sample volumes, achieved through a ready to use model with API access to batch upload cases and download results. Initial use requires minimal configuration and no additional hardware purchase. Watson for Genomics provides comprehensive interpretation across cancer types and supports all gene panel sizes including whole exome and whole genome sequencing. The breadth of cancers includes, but is not limited to, solid tumors, hematological malignancies as well as pediatric cancers. The system supports a wide variety of input formats for a comprehensive assessment of the alteration types relevant in somatic cancer.